A one-day symposium, ‘Mani in Cambridge’, was held on Saturday 25th March at the Ancient India and Iran Trust. The event was co-sponsored by the Trust, the International Association of Manichaean Studies and the Corpus Fontium Manichaeorum (with a small grant from the Union Académique Internationale). The study of the teaching of Mani (216-276 CE) and the history of his religion has been based on a series of remarkable textual discoveries made since the beginning of the 20th C in Central Asia (Turfan and Dunhuang), Egypt (Medinet Madi and Kellis) and South China (Quanzhou and Xiapu). International collaboration has long been a hallmark of research on Manichaean texts and between 2000 and 2005 the Trust, under the direction of its current Chair of Trustees, Nicholas Sims-Williams, was home to the Dictionary of Manichaean Texts project with a highly international research team. The Symposium, organized by myself, was attended by speakers and guests from at least nine countries (UK, Australia, the Netherlands, Germany, Denmark, Norway, Greece, Hungary and Italy) and was also blessed by wonderful spring weather which enabled the guests to enjoy their refreshments on the lawn. The papers presented by national and international speakers cover some of the key areas of on-going research on Manichaean texts from Central Asia, especially those written in Sogdian, Middle Persian and Parthian from Turfan, as well as those in Chinese from Dunhuang and Xiapu and in Coptic from Medinet Madi. Important historical issues such as forced conversion of Manichaeans in Byzantium, sectarian (?) identity of Manichaeans in Egypt, the content of the Manichaean canon and difficult textual readings were aired and discussed. The program ended with a reception and a ‘pay-your-own’ dinner at a local French restaurant. 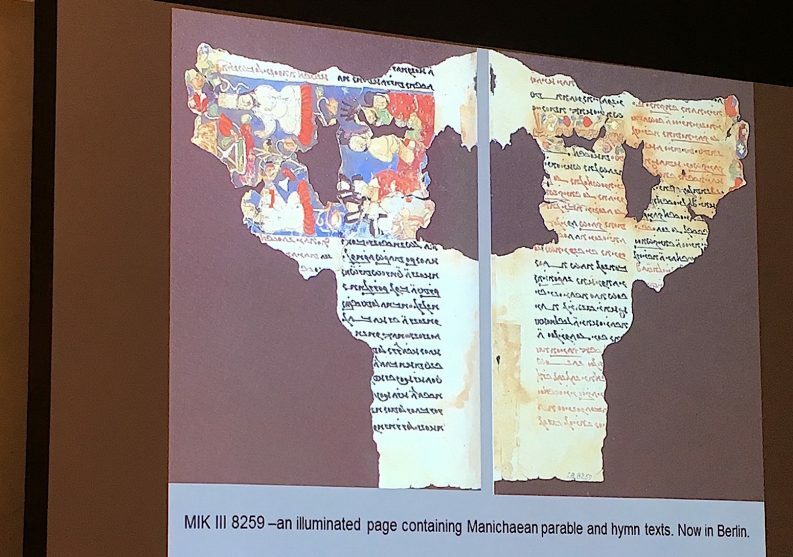 Because the Symposium had a pronounced emphasis on Manichaeism in the East, a number of scholars returned to the Trust the day after (26th March) for an impromptu 2-hour seminar on the unique Manichaean material found in Kellis in Egypt in the last quarter of the last century. Because this material was found entirely in a ‘community’ context, it can provide tentative answers to questions concerning the diffusion, preservation and destruction of the sect in the Roman Empire. ‘Mani in Cambridge’ was clearly a successful event and it has also generated a great deal of interest in the work of the Trust among speakers and guests who had not previously been aware of the Trust’s activities and events and the important and on-going role it plays in Manichaean studies.